Clouds are masses of tiny water droplets and ice crystals that float in the air. As such they do not have any color. But some look white and some grey. Some change shape continuously as parts of the cloud evaporate when they come into contact with the warmer air. Clouds are classified mainly by the appearance – dimension, shape, structure and texture. White stratus clouds are sheet-like, fair weather cumulus clouds consist of piled-up masses of dazzlingly white clouds. They are made of water droplets.Cirrus clouds are curly white made of ice-crystals at the high altitudes.in these clouds,water droplets or ice crystals are loosely packed and so light can pass through them without much loss in intensity. Some of the clouds which cause are the rain are the stratus and stratocumulus which are near earth clouds. stratocumulus clouds are not as thick as stratus clouds so they have light and dark areas. Altostratus clouds form smooth white or grey sheets across the sky. Sometimes, these clouds are so thick that the Sun or the Moon cannot be seen through it. At time the difference in thickness may cause relatively light patches between dark parts but the surface of the clouds do not show any relief. 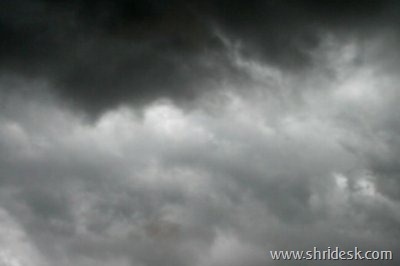 Nimbostratus clouds are low, amorphous and occur at higher altitudes, These are dark, grey and uniform. Cumulonimbus are the main rain clouds which are black. This is because light cannot penetrate through them as they deep and densely packed with water droplets, ice and snow particles. If we look for an aircraft flying at high altitudes, these clouds will look dazzlingly white, as they reflect all lights falling on them, but for an observer on the ground the clouds may look black and be raining. clouds are thus white and black at the same time!